Around a third of Argentina's population lives in the 'greater' area of this South American nation's capital and most populated city, Buenos Aires. In fact, only Sao Paulo in Brazil boasts a bigger metropolitan population among Latin American cities than Buenos Aires. The city from where the Tango dance originated has overcome a tumultuous past history filled with wars, coups d'état and dramatically fluctuating economies, to become one of Latin America's most peaceful, prosperous and exciting cities. Prior to European arrival, the Guarani and the Diaguita were the area's most prominent inhabitants. Both tribes helped develop maize cultivation, while the Diaguita stopped the Inca from conquering Argentina long before Europeans first set foot on its soil in the early 16th century. In 1516, indigenous tribes killed Spanish explorer Juan Diaz de Solis, the first European to sail into present-day Argentina. The same tribes forced the Europeans to flee their first attempt at a permanent colony and head for Asunción, Paraguay in 1539. The Europeans did not succeed in establishing a permanent settlement in Buenos Aires until 1580, after many indigenous tribes perished from European diseases. By the early 17th century, pirates replaced indigenous tribes as the biggest threats to Buenos Aires. However, smuggling and illicit trade also formed a large part of the overall economy, as the city was prohibited from foreign trade. At this time, Spain paid far more attention to Peru than Argentina, since it was rich in gold and silver. Buenos Aires finally found a prosperous and legal industry in its surrounding grasslands, where cattle provided beef and treated leather hides, which Europeans used to make clothes, shoes and accessories. 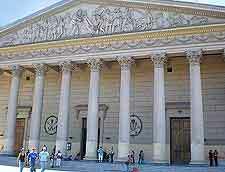 Of note, in 1776, Buenos Aires became the base of the new Viceroyalty of Rio de la Plata. When Spain came under Napoleonic French control, the British staged two Buenos Aires invasions, in 1806 and again in the following year. After the city successfully fended off the British without Spanish assistance, it gained in confidence and pride. Shortly after Napoleon Bonaparte's French troops invaded Spain, Argentina declared its independence in 1816. Bloody conflicts between Unitarians wanting a strong national government, and Federalists who desired more provincial power, broke out in Buenos Aires. The much-hated Mazorca secret police persecuted the Unitarians, who formed the majority of the city's population, during the rule of Federalist Juan Manuel de Rosas. The year of 1852 saw Rosas ousted, while Argentina ratified its first constitution just a year later. Following two failed mid-1800s British and French invasions, Buenos Aires entered the most prosperous period in its history, especially after the railroad connected its port with its surrounding cattle ranches. 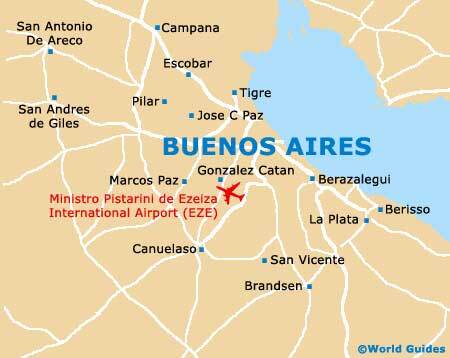 European immigrants flocked to Buenos Aires during the early 20th century. Although most of these immigrants came from Italy and Spain, Buenos Aires also welcomed many Germans, British, and in more recent years, Asians. Infamy was heaped on the country, however, during and after WWII, when many high-ranking Nazi officers escaped Europe and managed to set up new lives in Argentina. Argentina's most famous leader, Juan Domingo Perón, first came to power as the Argentinian president in 1946. He was especially popular among the working class, due to his education reforms and pro-union stance. In June of 1955, Argentina's navy bombed the Plaza de Mayo in a failed coup d'état, but Peron was eventually deposed during another military revolt just three months later. Perón died a year after his 1973 re-election and his wife, Maria Eva Duarte de Perón (often known as simply 'Evita'), succeeded him until another military coup overthrew her in 1976. When the military governed Argentina between 1976 and 1983, they cracked down hard on suspected dissidents, many of whom mysteriously disappeared altogether and remain missing to this day. About 30,000 people were believed to have been executed during this 'Dirty War,' which served as part of a larger alliance between South American right wing governments. After the 1983 end of the military dictatorship, many of its leaders received lifetime prison sentences. This was a dark period in Buenos Aires history, as was the bombing of the Israeli Embassy the following decade. Argentina's economy completely collapsed in 2001, after two years of recession, preceded by many more years of inflation. Numerous businesses went bankrupt and up-to a quarter of Argentina's total population became unemployed before the economy finally stabilised. 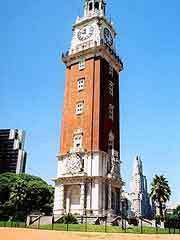 Buenos Aires, and the rest of Argentina, has once again become a calm and prosperous city.